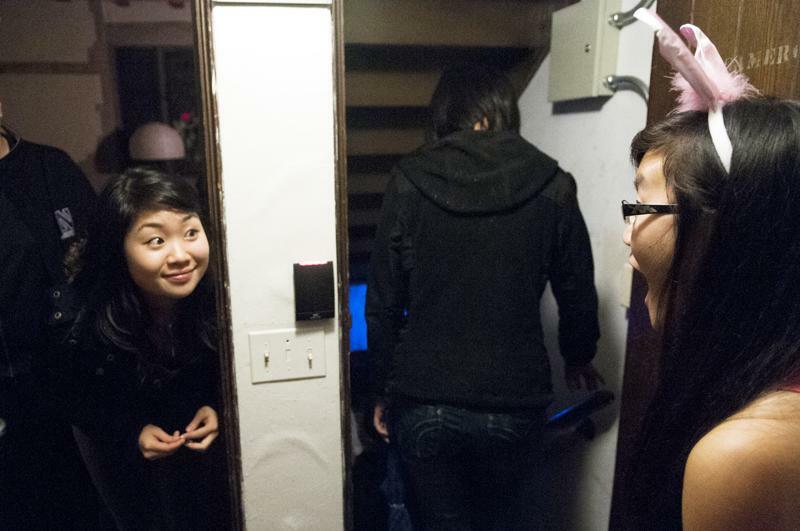 McCormick junior Christina Hua welcomes visitors to a haunted house held in Seabury Hall on Wednesday night. The event was organized by Plex and Seabury community assistants. Students dressed up as Jigsaw, a surgeon and monks with blood strewn over their faces haunted the basement of Seabury Hall on a rainy Wednesday night. Residential Services oversaw the haunted house, which community advisors from Foster-Walker Complex and Seabury organized weeks in advance. Community assistants used the Halloween-themed event to advocate Misericordia, a nonprofit organization that houses and provides support for people with developmental disabilities in Chicago. Participants in the haunted house could also donate directly to Misericordia. About 120 students attended the event, Foster-Walker community assistant Chen Cheong said. Groups of up to five participants each filtered through a corridor tangled with cobwebs, caution tape and skeleton bones as actors dared them to grab glow sticks strategically placed near scare locations. Communication junior Jae Yun said a Foster-Walker CA encouraged him to be an actor during the event. He wore a blue surgeon’s smock and spread fake blood over it. Foster-Walker and Seabury residence director Daniel Amato handed him a bloody heart as a prop to go along with his costume. “I kind of feel bad to need to scare people, but they come here to be scared,” Yun said. Money raised from the event was originally slated to go toward Dance Marathon. However, after visiting Misericordia on a trip for a leadership class, Cheong, a Weinberg sophomore, persuaded the other CAs to raise money for an organization outside of Evanston. Because the state government is falling behind in its payment to Misericordia, the organization has to rely on private fundraising to provide housing, employment opportunities and other services to its residents. Misericordia has a waiting list of 500 to 600 people, about the number of residents it already has, Misericordia representative Julie O’Sullivan said. Organizers were able to host the haunted house in Seabury because dining services were cut at the Great Room due to construction. The dining hall will now be used as a catering location, said Jason Sophian, nuCuisine marketing manager. Students gathered in the Great Room and indulged in refreshments after walking through the haunted house. Amato said the Seabury basement was the perfect setting for the CAs to rent out. “Since it’s not a completely finished space, not much (work was) needed to make it into a haunted house event,” he said. Lia Volpi and Lucas Freire, visiting students from Brazil, said the haunted house served as an introduction to Halloween, an American tradition they had never experienced. “It’s not just a good event for Halloween but also for charity,” Freire said.